A farmhouse kitchen sink is reminiscent to large sink basins that were used many years ago. Nostalgic, charming, durable, functional and elegant – no wonder this type of sink is so popular! 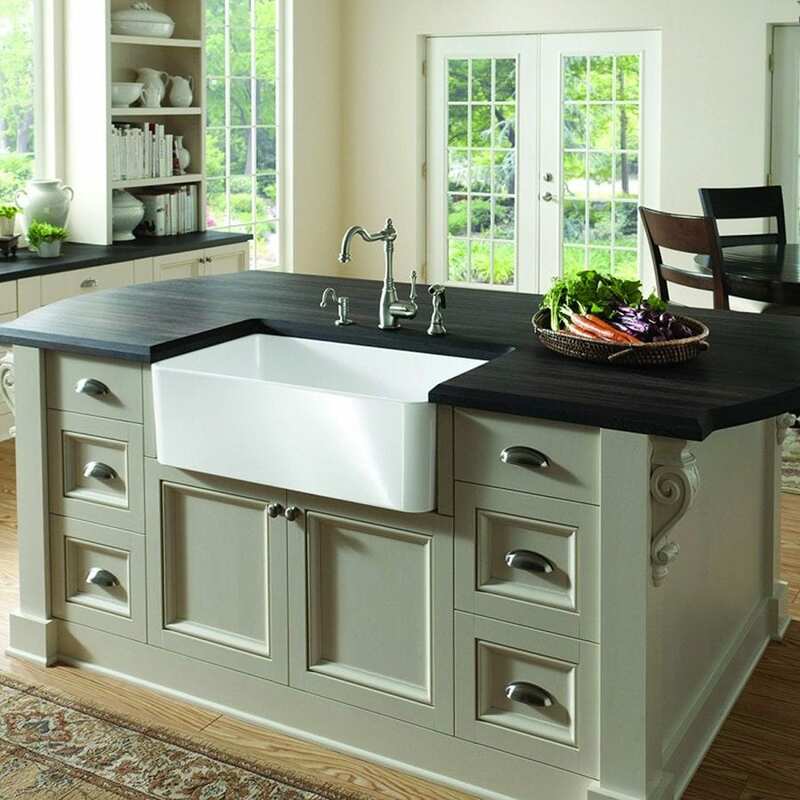 Whether you’re considering a kitchen remodel or a new sink installation, you’ll never go wrong with farmhouse sinks. 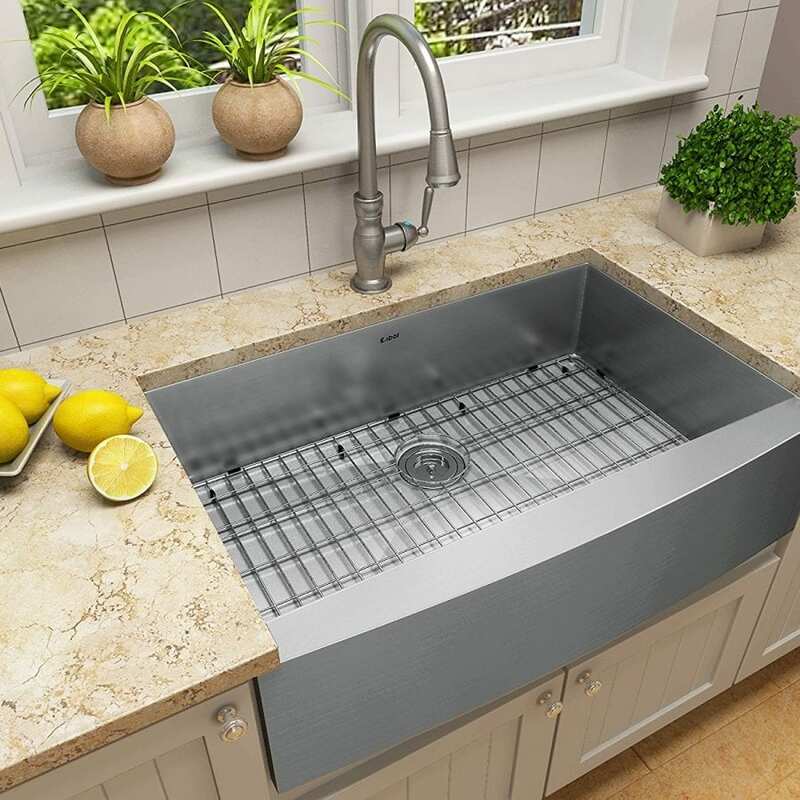 Farmhouse sinks are also known as apron sinks or apron front sinks because of their wide, drop down apron-like panel design. A farm sink is the perfect addition when you’re aiming for a rustic sense of style for your kitchen. It enhances traditional and country style kitchens with little to no effort. We start by going through the different types of farmhouse sinks you can buy for your country home. 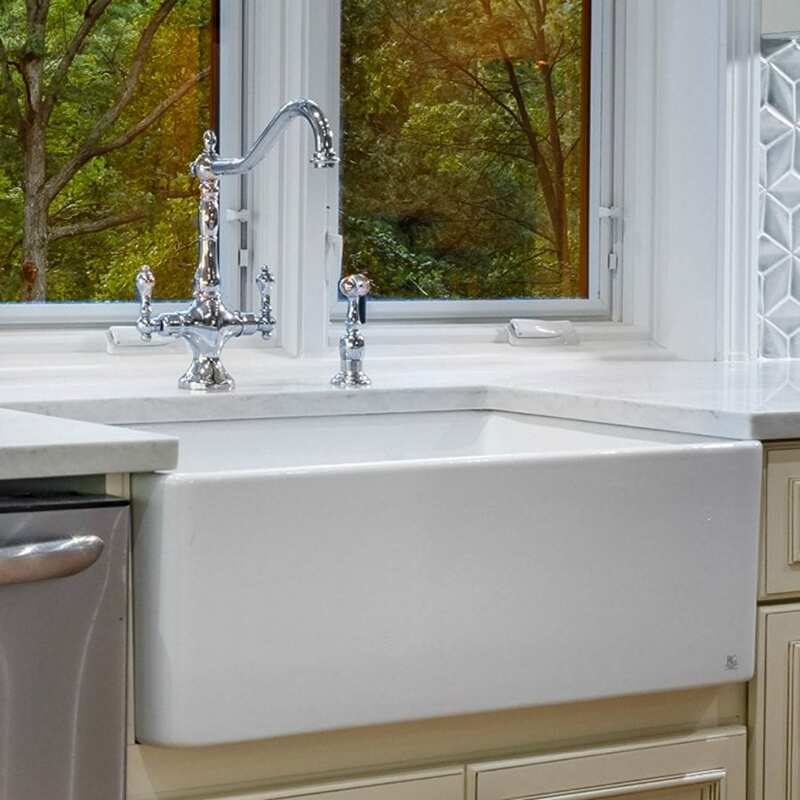 If you keep scrolling, you will find even more products to purchase, tips for choosing farmhouse sinks, and the best sink materials. As mentioned, stainless steel is tough, durable and it can last a long time. Plus, maintaining it is a pretty straightforward affair. Stainless adds a nice touch, a contemporary feel that’s closely associated with country and traditional style kitchens of yesterday. Any modern-themed kitchen and appliances will work nicely If you’re going for a stainless steel farm sink. You can choose many different sizes and configurations. 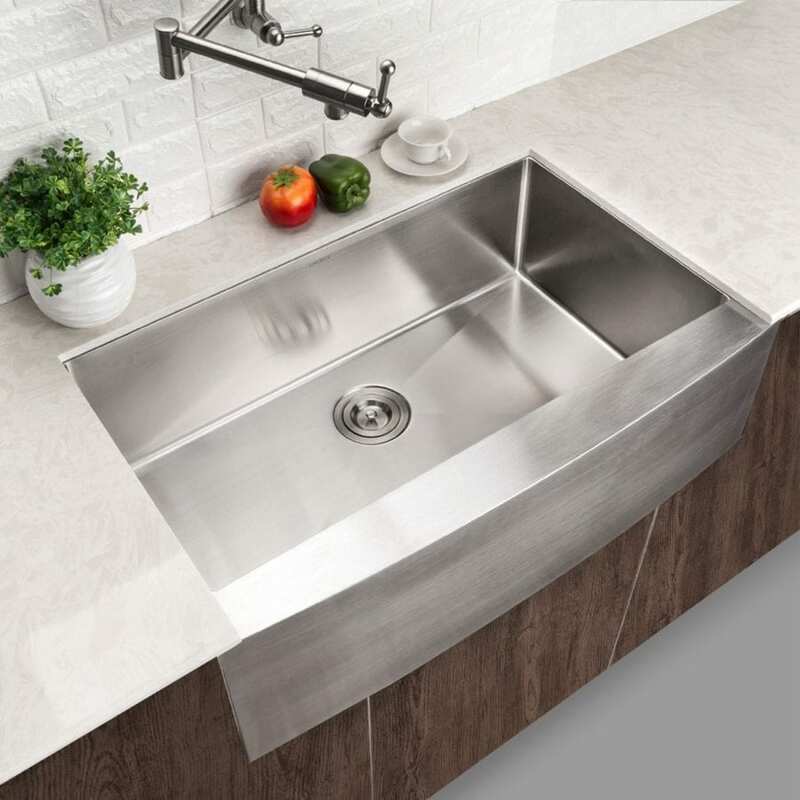 A stainless steel farmhouse sink has plenty of benefits including beauty and durability. 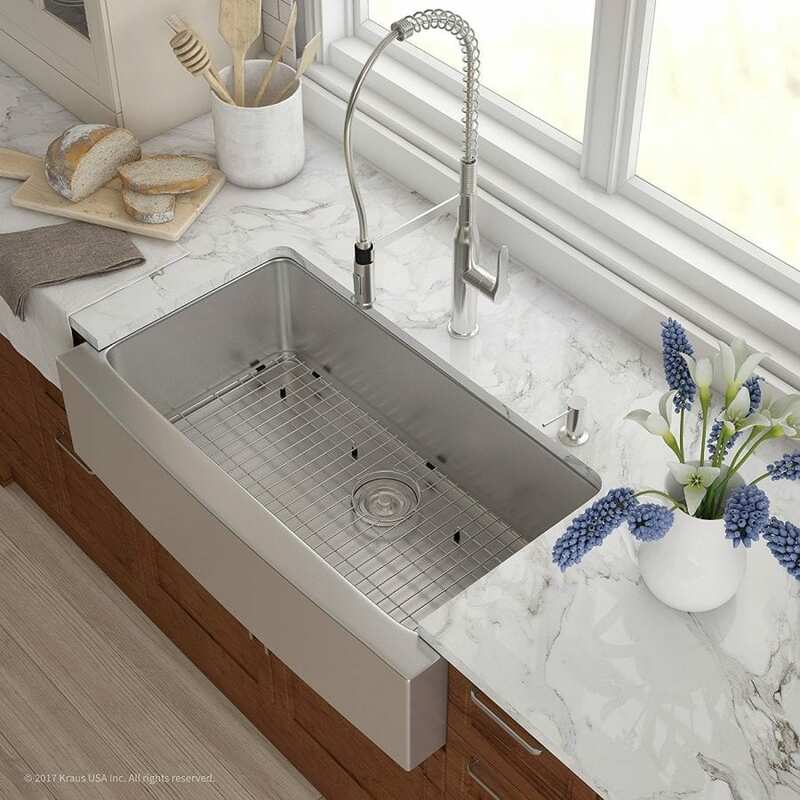 Check out our guide to stainless steel farmhouse sinks. Fire clay is generally special-treated clay heated up to high temperatures, which hardens the clay and makes it more durable. You get a natural polished finish when you go for a fireclay sink. This type of sink is easy to clean and is highly resistant to chipping and scratching. Check out our guide to Fireclay Farmhouse Sinks. In the cast iron section, you can choose different enamel bath products and kitchens- the enameled steel type and the enameled cast iron type. Let’s start with the enameled steel type. This option became widespread when enameled cast iron farm sinks grew in popularity. Though cheaper, steel is somewhat less durable as compared to the cast iron type, which made it more prone to denting and chipping. In terms of appearances, it will be hard to tell the difference between the two until the contractor says which is which. Enameled cast iron is ultra heavy, hard and rigid iron that’s coated with enamel. In terms of strength and durability, enameled cast iron is the closest to the original farmhouse sinks of old. These are the ones that have stood the test of time and still look spectacular. The best copper-type apron sinks in the market are those that have been properly built using several factors- environmentally sound, individually hand crafted ones are better than machine-made copper sinks as they have a superior finish and are more structurally sound. They can be recycled completely, thus leaving zero carbon footprints. Check out our guide to copper farmhouse sinks. The white color makes these types of farm sinks the centerpiece of your kitchen. You can do a black and white decor and choose either a black or a white farm sink to complete the decor. But because of the purity of the color, the slightest stains, grime and dirt will show. Bottom line is that white needs high care and maintenance if you’re willing to do the work. 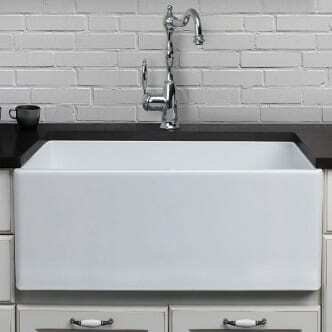 The white farm sink types can come in a variety of styles, decorative designs and shapes. 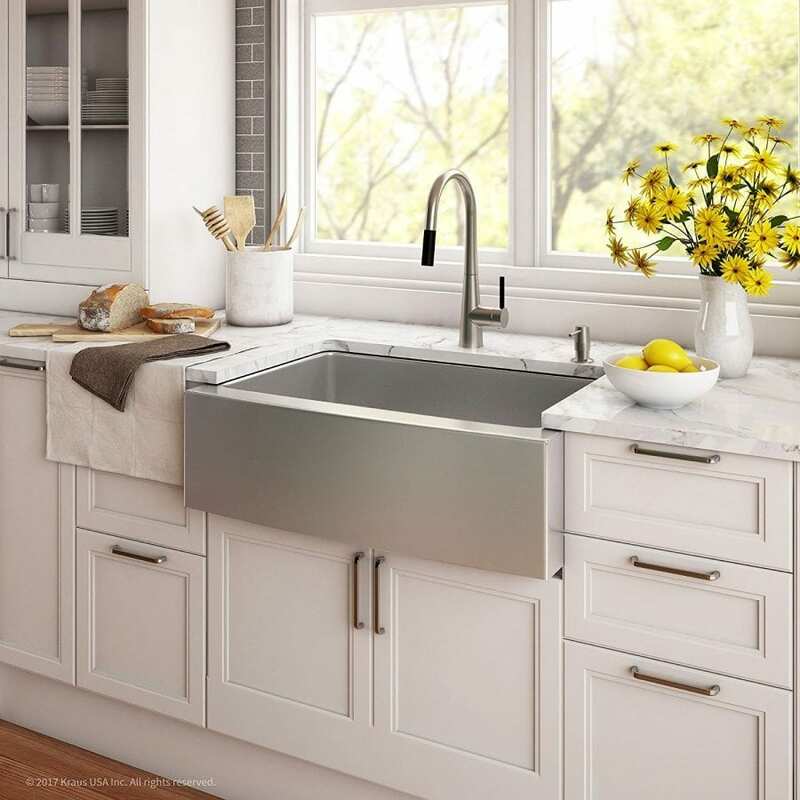 Check out our guide to white farmhouse sinks. Black apron-front sinks are becoming more popular, especially if you have black appliances. Black is an unconventional color for a sink, which catches people’s eyes as soon as they enter the kitchen area. Put it in a dominant-white themed kitchen and the aura increases more spectacularly. Stone sinks are generally cut from one solid piece, which gives you several notable advantages. For one, there are no seams or lines that catch dirt, crumbs and therefore, cleaning is as easy as washing with warm soapy water and wiping with a clean cloth. If you want a non-staining finish then you’ll have to get the contractor to use a stone sealant. Natural stone is quite difficult to crack and chip and is a tough material. It’s great for cooking because the material is practically heat-proof. Perhaps the biggest advantage of having a stone-type farm sink is that you can design or carve it however you like. Moreover, stone comes in many different variations that you’ll never be lacking in design ideas. No stone farmhouse sink will look the same. Stone farm sinks are expensive and go upwards a thousand dollars or more, but once you install it you won’t have to think about getting a replacement. It will last forever and is definitely worth the investment. We compare some of the most popular materials used to make farmhouse sinks including fireclay, cast iron, stainless steel, copper, and stone. The right material can be had for the right price, but you do not want to sacrifice quality. Learn what material will work best for your needs below. 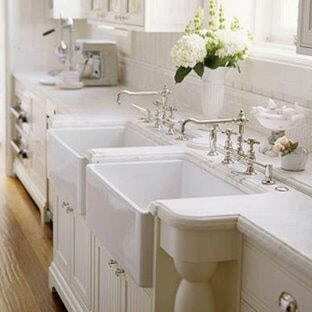 The most authentic farmhouse sinks are either made of fireclay, ceramic or has a white color. For those who want to fit in their farm sink to match the home’s design and theme, there are different types of sink to choose from. Fireclay is a sink material that’s similar to that of pottery as it is handmade. Fireclay is preferred over cast iron because of its ability to maintain a solid color as it ages. When the enamel chips off cast iron sinks, rusting occurs and you get a sink that’s kind of like a rusty old bathtub. Fireclay shines in a bathroom sink setting, but it may not do so well given the everyday wear and tear that a kitchen sink experiences. The heavier pots and pans will inevitably cause chipping and cracking to the sink on busy days. Porcelain and fireclay farmhouse kitchen sinks have a hard surface, making it more susceptible to contact noise. You will need extra care when washing the dishes and breakable materials as porcelain is not as forgiving as stainless steel. Keep this is mind when you’re washing precious china or your favorite wineglasses. Cast iron is such a durable material that it can last far longer than expected. This is why cast iron is one of the most popular material of choice in sinks for decades. Moreover, cast iron as a sink is available in hundreds of colors while lending an undeniable charm. If you like your farmhouse sink built to last and you wouldn’t want to compromise on your decor scheme, then cast iron is the best option. Stainless steel material is a crowd favorite because of many reasons. They are easier to install, less expensive and are lighter as compared to most farmhouse sink materials. You’ll need to check the steel gauge as it is the sole indication of the quality of the stainless steel. The lower the number, the better it is because the measurement of gauge is in thickness. For example, a farm sink that’s made of 18 gauge stainless steel is better than a sink having 24 gauge material. Moreover, stainless steel is highly resistant against stains and chipping, but they tend to collect scratches as time goes by. Copper is arguably the best-looking of them all. You can opt for a colored patina and a hammered finish while the sink undergoes manufacture. Over time, copper develops a beautiful patina hue as it comes to contact with different substances. Furthermore, copper is a natural anti-microbial agent and requires less maintenance than most farm sink materials. Luxurious homes in the 1900s used farmhouse kitchen sinks that were made of limestone, but today the popular choices are granite and soapstone. Limestone is still viable and an open choice for those who prefer a more Old World style in the kitchen. Marble is also available but it’s probably the most expensive out of the stone category. Stone sinks are carved out using one massive and solid stone piece. You can choose to have the front side of the sink in its natural uncarved state, polished or carved to an intricate design. You may also choose to have a somewhat boxy farm sink using slabs of stones such as granite, marble, etc. if you want a matching countertop. If stone is your material of choice, the contractor will have to come up with extra support to keep your sink from prematurely crashing. Stone naturally absorbs liquids and can stain, chip or crack. To preserve the natural beauty you’ll need to ensure the material is sealed properly and maintained via re-sealing after a few years or so. Farmhouse kitchen sinks became popular in the 1600s. This was the time when plumbing wasn’t invented yet, and water had to be gathered in wells using buckets. The sink’s primary purpose was to store and conserve household water for everyday use. A good farm sink is large enough to hold great volumes of water that was collected from nearby rivers, lakes and wells. From that concept came two types of kitchen farmhouse sinks, one from Britain and another one from Ireland in the 17th century. The function was the same but each had their unique defining characteristics. The London sink was built to be more shallow than the Belfast sink. It was designed to store precious water during times of scarcity. One of the best features in the London sink was that it had no overflow in order to keep every last drop of water collected. The Belfast sink is deeper and has an overflow that allows water to be drained easily instead of spilling on the side. The farm sink is best for suited for utilitarian kitchen work during the old days. It is tough and can withstand abuse, especially if you’re planning to cook meals in huge portions. The farmhouse sink is the avid cook’s best friend. It serves as the focal point or a sturdy workhorse, able to accommodate the largest stock pots or baking trays. Plus, it’s deep enough to reduce excessive spillage and splashing, which allows the cook to concentrate on his or her work more than the minor details. The forward-facing orientation distributes the workload stress better as compared to undermount or drop-in sink types. The depth is big enough to accommodate washing the largest pot or cooking utensil in the house. The usual space for farm sinks range at around 20 to 36 inches, but you can opt for the extra large sinks that are 60 inches wide! A deep basin means you won’t have to stack pots over each other and you can cut up and prepare ingredients en masse. 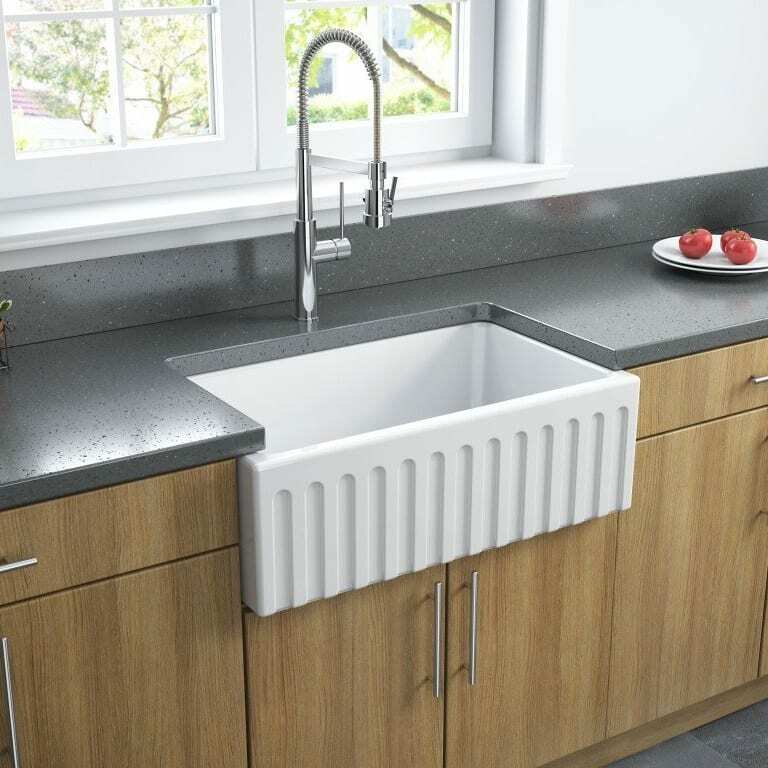 A farmhouse sink can be of the single or the double basin variety, with options to have a wide single bowl or a double bowl with a slightly lower divider. Having two large basins allow you to clean dishes and utensils on one while preparing food on the other. Moreover, the two basins come in handy for putting soap water in one while rinsing on the other. A typical farmhouse sink will not have a hole for faucets, so it’s best to position the tap along the cabinetry, the wall behind it or the counter. Replacing the sink is as simple as disconnecting it from your drain pipes, lifting the unit out and lowering a new one in. There’s no need to turn off the water main. 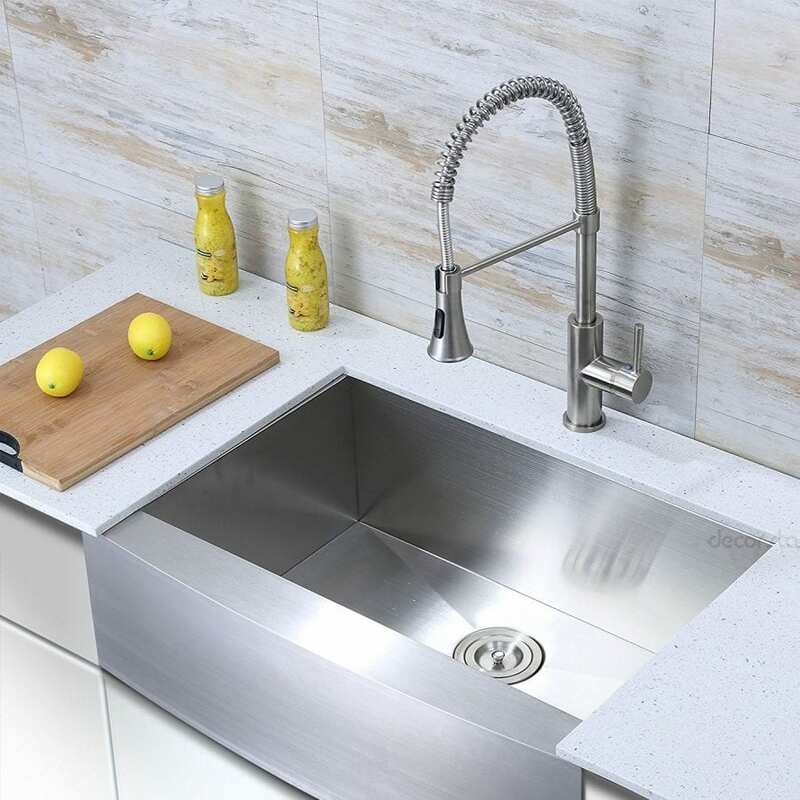 Farmhouse sinks may be installed just below your countertop level, making the countertop appear slightly overhanging on the sides of your sink. With this setup, it will be easy to wipe water from the countertop straight to the farm sink. 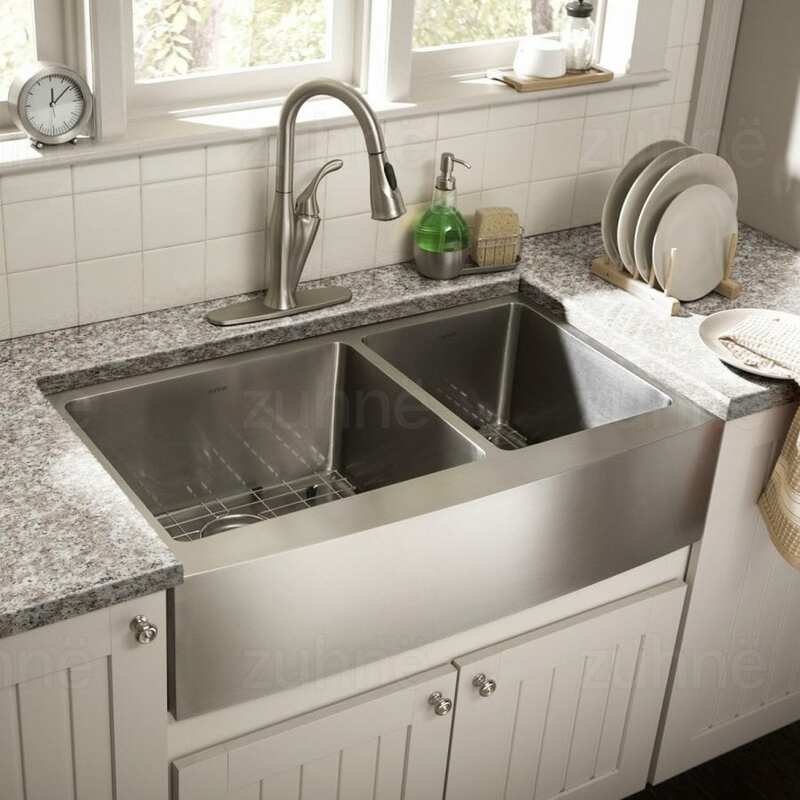 You can decide just how much you want the farmhouse kitchen sink to protrude in the front and above the countertop before the unit is installed in place. The best recommended position is to have the sink moved further forward than typical undermount or drop-in sinks, giving you a level of ergonomic positioning with less body movement and stress. The original farm sink sat slightly forward to the surrounding cabinets so that if spillage were to occur, the water drops to the floor instead of the cabinetry. Opting for the apron-front sink will mean fewer surface puddles and less splashing overall. 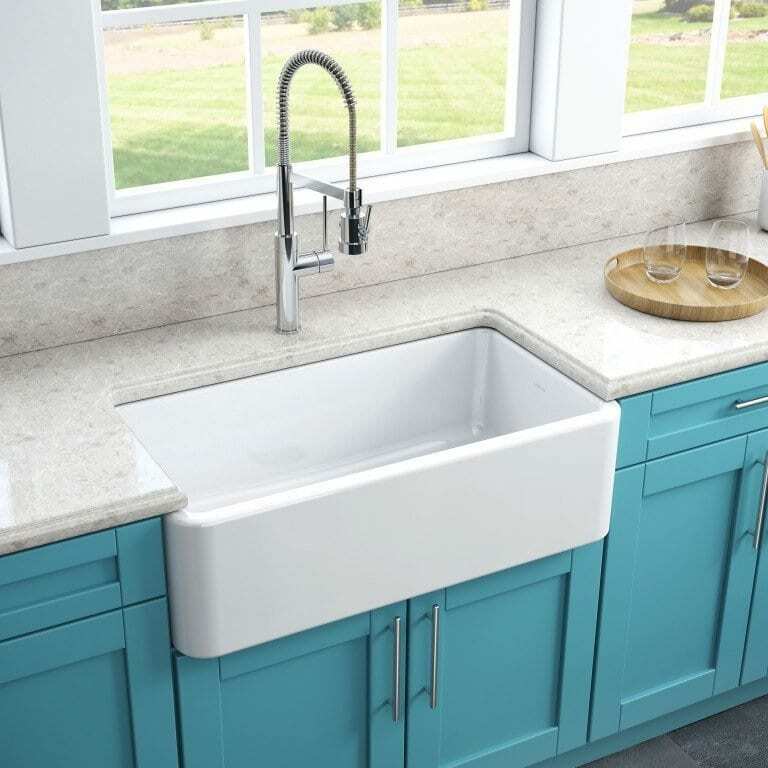 Choosing the type of farmhouse sink you’ll put in your home is a serious matter, as they are more expensive as compared to undermount or drop-ins. But rest assured that your farm sink will last long and prove to be the best kitchen investment you’ve ever had. This entry was posted in Farmhouse Kitchen Decor, Farmhouse Sinks. Bookmark the permalink.